However, these companies can be expensive. More people are choosing Christian Healthcare Ministries because they are affordable, and you get to bear the burdens of other believers. Here are the best sharing ministries to use. The way it works is simple. Different healthcare companies work slightly different. Usually members will have a monthly share amount. Every month your share amount will be matched by an eligible medical bill of another member of your sharing ministry. Certain companies allow you to interact with other members. Make sure that you let your sharing ministry know about any pre-existing conditions that you have. Medical issues resulting from an unbiblical lifestyle. Christian Care Ministry was founded by John Reinhold in 1993. CCM promotes Medi-Share, which is their sharing ministry. Out of all the Christian healthcare ministries, this one is my favorite. Medi-Share holds to a biblical statement of faith. They hold to salvation by grace through faith in Christ, the deity of Christ as being God in flesh, and His death, burial, and resurrection. 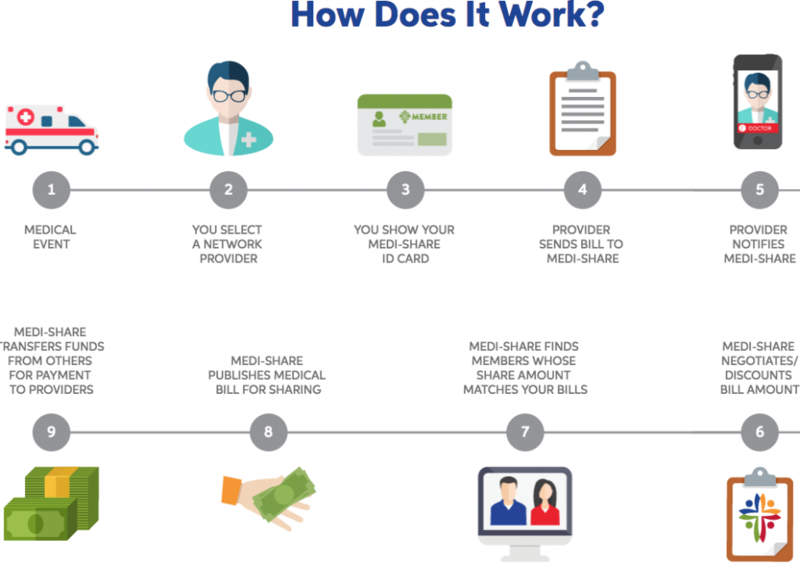 Medi-Share is also the most affordable health insurance alternative. You may be able to receive a rate for as low as $30 a month. No other sharing ministry comes near to $30 a month. Medi-Share members report an average monthly savings of $380 a month. The cost of Medi-Share varies per person depending on the age of the individual, household members, and your AHP. Think of your (AHP) Annual Household Portion as your deductible. Your AHP is the amount that you are responsible for before your medical bills are able to be shared by other members. There are several AHP options to choose from. You can choose a $500, $1,250, $2,500, $3,750, $5,000, $7,500 or $10,000 AHP. Choose the one that best fits your budget. The higher your AHP the more that you will be able to save on your share amount which is similar to a monthly premium. Click here to get pricing today. One of the best features of using Medi-Share is Telehealth. With Medi-Share you will be given free virtual doctors. You no longer have to wait a long time to receive help for your flu, cold, headache, insect bite, etc. You will be able to receive treatment and receive a prescription right from home 24/7. This is another factor that increases the savings with Medi-Share. For more serious medical situations, then you will have to pay a $35 provider fee for each office or hospital visit. If you must visit the ER, then you are going to have to pay a $200 ER fee. Medi-Share offers millions of PPO providers at discounted rates for their members to choose from. Whether you live in Florida, Maryland, Kansas, Texas, California, etc. you will have no problem finding a provider in your area. Medi-Share is for all ages. However, applicants who are 65 and older must join their Senior Assist program. This program is designed for seniors with Medicare Parts A and B.
Medi-Share members will be able to receive a 20% discount by living a healthy lifestyle when they join the Health Incentive program. As a member you will be able to save up to 60% on vision and dental. You will also be able to save on LASIK, hearing services, and prescription drugs. Medi-Share is easy to use. When a medical emergency happens all that you have to do is select a network provider and show your ID card to them. Your provider will send the bill to Medi-Share and they will look for discounts. You will be matched with others who have the same bill as you and then your bills will be allowed for sharing. After your bill is shared you will be able to thank, encourage, pray for, and maintain friendship with the members who shared your medical bills. Pray, encourage, and grow in relationship with other believers. Millions of providers around the nation. There is no cap on the amount that is able to be shared. Is Medi-Share worth it? Yes, there are many things to love about Medi-Share. To learn more about Medi-Share and to get pricing in seconds. Please click the button below. Liberty HealthShare was founded in 2012 by Dale Bellis. Liberty HealthShare does help you to save on healthcare but the problem that I have with Liberty HealthShare is that they do not have a biblical statement of faith. When reviewing Liberty and Medi-Share it is clear that Liberty HealthShare compromises. I can’t recommend a company that doesn’t hold to the essentials. Unlike other Christian healthcare options, you don’t have to be Christian to use Liberty HealthShare. Whether someone is an atheist, Mormon, Jehovah Witness, Catholic, etc. anyone can qualify for Liberty HealthShare. Although Medi-Share is more affordable, Liberty does offer good prices. The Lowest Liberty rate is going to be for around $100. Liberty offers three plans that you can choose from. Liberty Complete, Liberty Plus, and Liberty Share. Singles under 30 have a suggested monthly share amount of $249. Those who are between the ages of 30-64 have a suggested monthly share amount of $299. Those who are 65 and older have a suggested share amount of $312. Depending on the age couples will have a suggested monthly share amount of $349 to $431. Depending on the age, families have a suggested monthly share amount of $479 to $579. 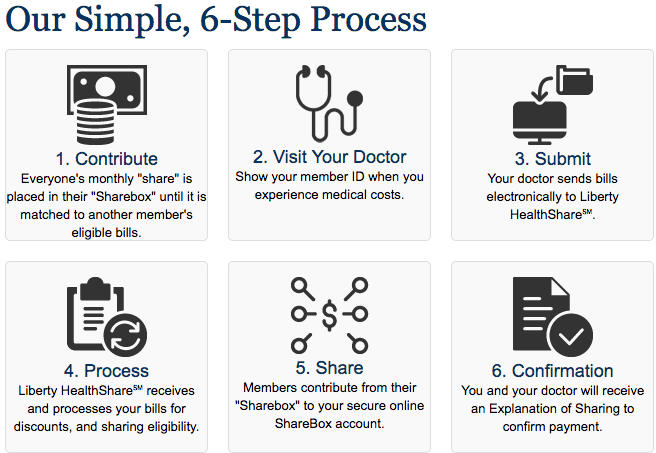 Liberty HealthShare has an (AUA) Annual Unshared Amount, this is similar to a deductible amount. This amount can range from $1000 to $2250 for a family. Liberty HealthShare members are going to have to pay $45 for primary care and $100 for specialty care. Liberty HealthShare has thousands of in network providers for you to choose from. With Liberty there is a cap on the amount that is able to be shared. Liberty Complete has a $1,000,000 cap per incident. Liberty Plus and Share have a $125,000 cap per incident. Your monthly share amount is placed in a Sharebox until the amount is matched to someone else’s medical bills. You will then visit your doctor and show your member ID and your doctor will send your bills to Liberty. Your bill will be processed for discounts and sharing eligibility. Members will then begin sharing. To confirm payment you and your doctor will receive an explanation of sharing. Medical and pharmacy discount services when you choose Liberty Share and Complete. Samaritan was founded in 1994 by Ted Pittenger. Samaritan Ministries is similar to Medi-Share in many ways. Samaritan has a biblical state of faith and Samaritan is affordable. Your rates are dependent on the Samaritan plan that you choose, your relationship status, members in your household, and your age. Samaritan Basic costs $100–$400 per month. Samaritan Classic costs $160–$495 per month. With Samaritan you have an Initial Unshareable, which is your deductible amount. Samaritan Basic has a $1500 Initial Unshareable. The Classic plan has a $300 Initial Unshareable amount. Samaritan differs from other healthcare providers on this list because it takes a self-pay approach. Samaritan Ministries will only step in for more serious and expensive issues. For minor situations you are going to have to pay for your medical bills out of the pocket. Once again, Samaritan Ministries has more of a self-pay approach, so you will be able to go to any doctor without worrying about being penalized for going to an out of network provider. Samaritan Ministries Members will receive discounts on labs and pharmacies. Members will automatically be enrolled in EnvisionRX. A medical need begins, Samaritan Ministries publishes the need, shares are received. You are able to go to any provider without receiving a penalty. Altrua HealthShare was founded in 2000. Although Altrua is not as popular as the other options on this list, they do offer biblical healthcare. Sometimes healthcare ministries might require your pastor to sign an acknowledgement that shows that you are a Christian and you attend church regularly. With Altrua you do not need your pastor to verify on your behalf. Altrua is faith-based, but there is no doctrinal requirements to join their program. Monthly contribution ranges from $269.00 to $874.00. Monthly contribution requests are based on your plan, age, and household members. Members are limited to 6 doctor visits per year. After 6 visits you will be responsible for all other office visits. Office visits will cost $35 per visit with the Gold and Silver plans. Altrua HealthShare is part of MultiPlan. With the MultiPlan network you will have millions of providers available to you. Altrua HealthShare is in partnership with Careington International Corporation to offer discount options for dental, vision, hearing, prescription medicine, and more. The Healthy Living plan costs $14 a month. A member + family is going to cost $18 a month. The medical needs of Altrua members will be shared according to their guidelines. All members are asked to submit a monthly amount. When you need medical attention, choose a provider and show them your ID card, and the provider will submit your medical needs. 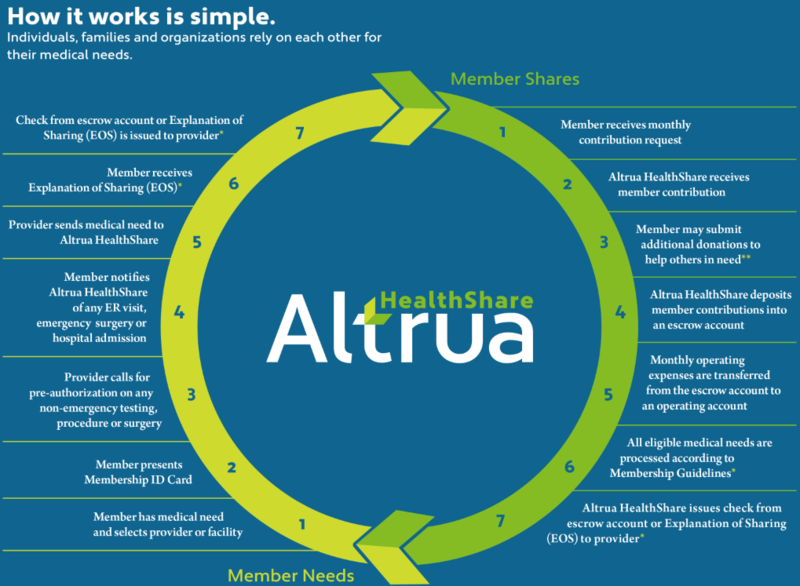 Altrua is part of one of the largest health care networks. 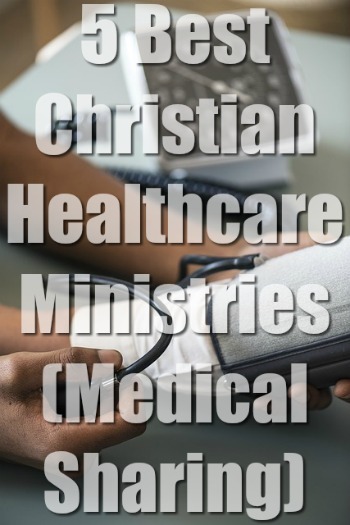 Christian Healthcare Ministries was founded in 1981. CHM says that to join the ministry you must be a Christian, but they do allow Non-Christians to join. CHM does not offer a doctrinal statement of faith. CHM offers 3 program options for you to choose from, Bronze, Silver, and Gold. They also offer a Brother’s Keeper program for medical needs that exceed $125,000. Prices can range from $90-$450/mo. Your personal responsibility limit or your deductible is going to cost anywhere from $500 to $5000. The difference between CHM vs other healthcare options on this list is that CHM does not negotiate your medical bills, which means that you might be paying more than you have to. It is all up to the member to negotiate the bill and try to get discounts, which can be a hassle. Which sharing ministry is the best? After comparing the most popular options, Medi-Share comes out on top. What I love about Medi-Share is that they have a biblical statement of faith. Some companies such as Liberty HealthShare fall short in this area. Medi-Share has no limits. Medi-Share allows you to save the most and you will get to grow in relationship with other members than with any other company. With great reviews and multiple advantages, I strongly recommend that you get rates today and see how much you can save.